Calpains make up a ubiquitously expressed, well-conserved family of calcium-dependent cysteine proteases. The calpain proteins are heterodimers consisting of an invariant small subunit and variable large subunits. This large subunit possesses a cysteine protease domain, and both subunits possess calcium-binding domains. Calpains have been implicated in neurodegenerative processes as their activation can be triggered by calcium influx and oxidative stress. Calpain 6 (CAPN6) is most similar to Calpain 5; the C-terminal region of CAPN6 lacks homology to the calmodulin-like domain of other vertebrate calpains. CAPN6 is thought to be involved in the regulation of microtubule dynamics and cytoskeletal organization. CAPN6 has also been recently identified as an HIV dependency factor (HDF), suggesting that CAPN6 may be an important drug target in HIV treatment. Western blot analysis of extract from NIH/3T3 cells, using CAPN6 polyclonal antibody ( Cat # PAB8485 ) . Western blot analysis of CAPN6 in rat lung tissue lysate with CAPN6 antibody at (A) 0.5 and (B) 1 µg/ml. 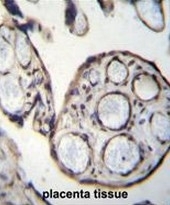 CAPN6 Antibody (Center) (Cat. #AP50726PU-N)immunohistochemistry analysis in formalin fixed and paraffin embedded human placenta tissue followed by peroxidase conjugation of the secondary antibody and DAB staining.This data demonstrates the use of CAPN6 Antibody (Center) for immunohistochemistry. Clinical relevance has not been evaluated. 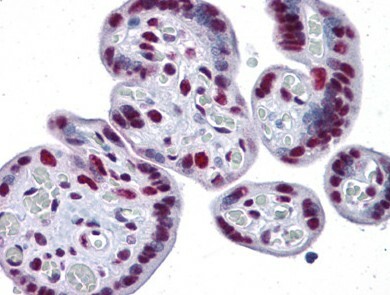 CAPN6 Antibody (Center) (Cat. #AP50726PU-N) western blot analysis in HL-60 cell line lysates (35µg/lane).This demonstrates the CAPN6 antibody detected the CAPN6 protein (arrow). 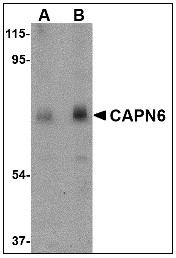 Western blot analysis of CAPN6 in rat lung tissue lysate with CAPN6 antibody at (A) 0.5 and (B) 1 ug/ml. 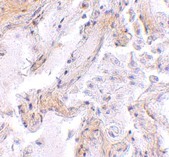 Immunohistochemistry of CAPN6 in human lung tissue with CAPN6 antibody at 2.5 ug/ml. Immunofluorescence of CAPN6 in Human Lung cells with CAPN6 antibody at 20 ug/mL.